Info "Is it cheating if I use a helicopter to get to the top?" Peak Peek is one of Orbulon's microgames in WarioWare: Twisted! The name is a pun on the term "sneak peek." 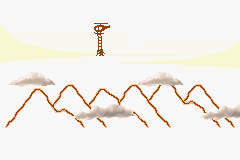 The game's purpose is to make the man land on the highest mountain. If done so, the game is won. However, if he lands on the wrong mountain, the player will lose the game. 1st level difficulty: Four mountains to choose from. 2nd level difficulty: Five mountains to choose from. 3rd level difficulty: Six mountains to choose from. This page was last edited on November 17, 2018, at 03:11.